Backcountry or bleachers. The Cush delivers versatile comfort. 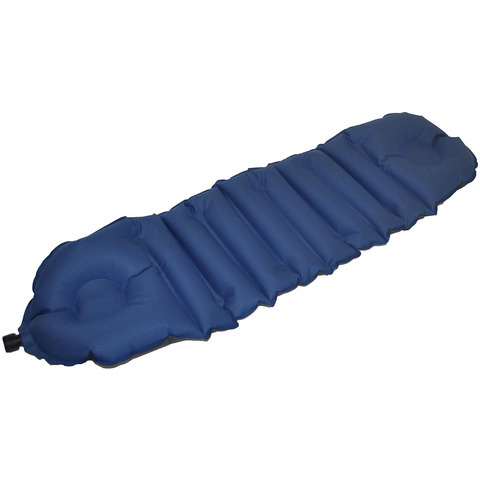 Ultralight, it packs down to pocket size and inflates with just a breath or two. Wrap it around your head when you nestle into your sleeping bag's hood. The ergonomic deign cups the ears and keeps air distribution consistent to minimize irritation at pressure points. Use it at single-layer thickness, or double - even triple it up for more comfort while sitting or taking a quick afternoon trail nap. Dimensions: 29"" x 9"" x 1.5"". Wt: 2.9 oz. Klymit Cush: A versatile and ultra light companion for any adventure, the Klymit Cush allows you multiple configurations to get that ideal level of comfort as your pillow or your seat. Folds easily for those who need more thickness - 1, 2 even 4 layers. Ear pocket for comfortable side sleeping. Dimensions: 29" x 8" x 1". Wt: 3 oz. Klymit Pillow X: The next generation of inflatable pillows has arrived! An innovative self centering design weighs under 2 oz. and packs up smaller than anything else out there. Dimensions: 15" x 11" x 4". Wt: 1.95 oz.